Digital Signage Media Player Market size was valued at over USD 950 million with a global shipment of over 2.5 million units in 2016. The growing demand for interactive digital signage and video walls in the retail sector will drive the digital signage media player market growth over the forecast timeline. To offer customers with more interactive experience, retailers are increasingly utilizing the media players to power the displays for advertisement & promotional purposes. Owing to the growing innovations and the ubiquity of online shopping, retailers across various regions are deploying digital signage solutions, such as media players, to offer an interactive experience to the customers. Due to the cost-effective nature coupled with easy-to-use characteristics, these devices are witnessing increasing deployment across various applications. For effective advertising & marketing as well as employee communication, businesses worldwide are creating and sharing fascinating visual content. These devices are smaller than a computer and are majorly used to display digital signage content on the screens. Due to the smaller size, these players can be plugged in easily into the back of a display without using any stand or adhesives. Owing to the easy installation & one-time screen setup and simple maintenance, these devices are growing in popularity across several industrial sectors, driving the digital signage media player market growth. Furthermore, the devices are increasingly used for streamlining several business operations. Launch of displays with in-built media players based on SoC (System on a Chip) platforms, offering advantages in terms of power consumption will restrain the digital signage media player market growth over the forecast timeline. Moreover, adoption of media streaming devices such as Chromebox, Apple TV, etc. can be a substitute to the industry resulting in high replacement rate, impacting negatively to the industry growth. Other challenges limiting the industry demand include risks of malicious attacks and integration of these devices with traditional networks. The software segment in the digital signage media player market is anticipated to grow at a CAGR of over 3% from 2017 to 2024. This growth can be accredited to the growing demand for software solutions that offer enhanced interaction while increasing the brand visibility, interaction, and customer engagement. The software solutions enable the end users to specifically customize the communication targeting the audience, which includes customers, visitors, personnel, and students. Growing utilization of such solutions for customer engagement, advertising & promotional activities, and streaming several types of content intended for specific customers is expected to drive the demand. 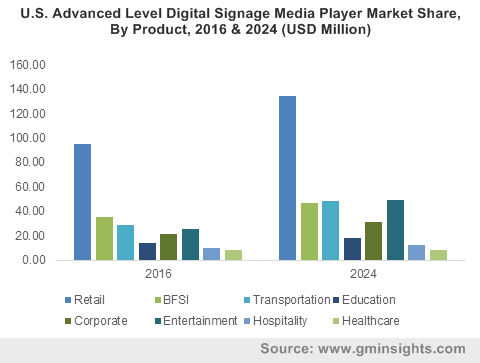 The demand for entry-level digital signage media players market is expected to grow owing to the surge in installation of such devices across retail, entertainment, BFSI, education, and healthcare sectors to improve the in-house customer experience. Entry-level solutions are standard commercial grade & low power devices for simple applications. Moreover, the low cost of such devices makes them an ideal fit for customers, who are concerned about the budget. Increasing use of these devices for displaying common content across regular retail kiosks, banks, and ticket counters in movie theaters is driving the digital signage media player market growth. Increasing utilization of digital signage media players market in retail applications for enriching the customer interaction as well as to attract new customers will fuel growth over the forecast timeline. The growing eminence of online shopping is posing a significant challenge to the traditional brick and mortar retail sector. To improve the in-store experience and to acquire new customers, retailers are increasingly spending on such advanced solutions. Furthermore, the increasing use of these devices that offer extensive interactive options, which engage customers with enhanced capabilities, such as touch screen, is contributing to the industry demand. North America digital signage media player market is anticipated to grow over the forecast timespan and this can be credited to the increase in spending on these devices by various sectors, such as retail, entertainment, BFSI, transportation, and corporate, to display advertising and promotional content. The surge in demand for effective corporate communications to maximize the return on investment and the cost-efficiency offered by such solutions contribute to the regional industry demand. China provides significant growth opportunities to the digital signage media player market due to the increasing deployment of these devices across the public and commercial sector for delivering eye-catchy advertising. Moreover, growing number of players and increasing manufacturing operations to develop these products at lower prices are driving China digital signage media player market. Companies in the digital signage media player market include Brightsign LLC, Advantech Co., Ltd., AOpen Inc., lBase Technology, IAdea, NEXCOM International, Inc., Barco, Broadsign, KeyWest Technology, Inc., Stratacache, Visix, Inc., ClearOne, NEC Display Solutions Ltd., Onelan, Hewlett Packard Company, and Scala. Vendors operating in the industry face intense rivalry and are required to make significant investments in R&D activities to remain competitive and sustain the growth. Players are increasingly focusing on developing compact & lightweight devices as well as incorporating customizable features to suit the customer needs. 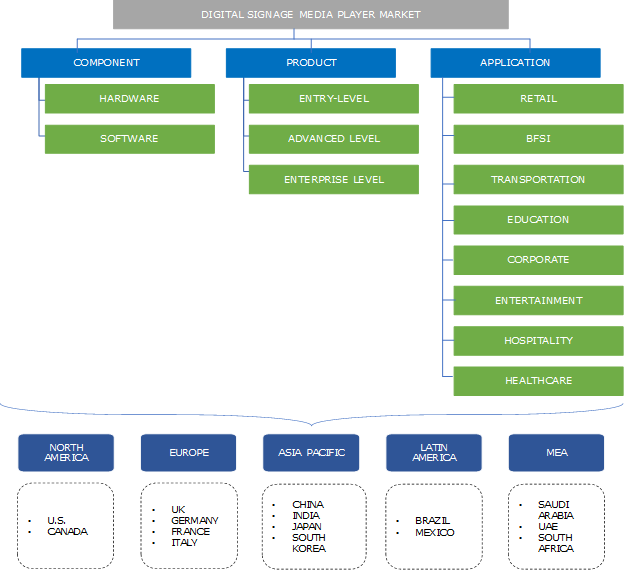 The digital signage media player market is highly fragmented in nature. A large number of regional and global players are operating in the industry, holding a very small share in the overall marketplace. Various sectors are heavily investing on these solutions considering the benefits offered such as enhanced customer engagement, increased footprint, and the improved overall experience. Media players are currently witnessing a significant adoption across retail, entertainment, and transportation sectors and have a huge potential for growth across these applications. Low cost and easy availability can be considered as major reasons for the mass adoption of these solutions.